…support up to 5 lbs. * Sock & Stocking Aid helps you get dressed by holding your sock while you slip in your foot. * Easy Reach Figure 8 Antimicrobial Body Sponge cleans hard-to-reach areas in the shower. 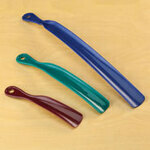 * Extendable Dressing Aid with Long Shoe Horn helps you slip on footwear and pull on clothing.